Strong currents are visible at Reversing Falls, a tidal waterfall off the coast of Pembroke in Cobscook Bay. As the boat cruised around Treat Island, 45 passengers shuffled around the deck to get a good view of the isle’s evergreen-covered hills, gravel beaches and open meadows. 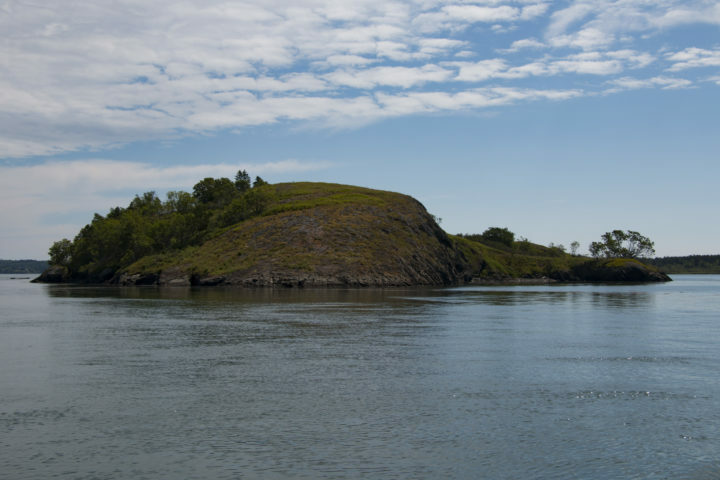 Located off the coast of Eastport, the 71-acre island, conserved by the Maine Coast Heritage Trust, was one of the first stops on the recent MCHT tour of Cobscook Bay. The boat tour, which sold out in one day, is one of many summer trips MCHT offers to its members and the general public each year. These trips are an opportunity for people to visit some of MCHT’s conserved properties and learn about the organization’s ongoing conservation projects. 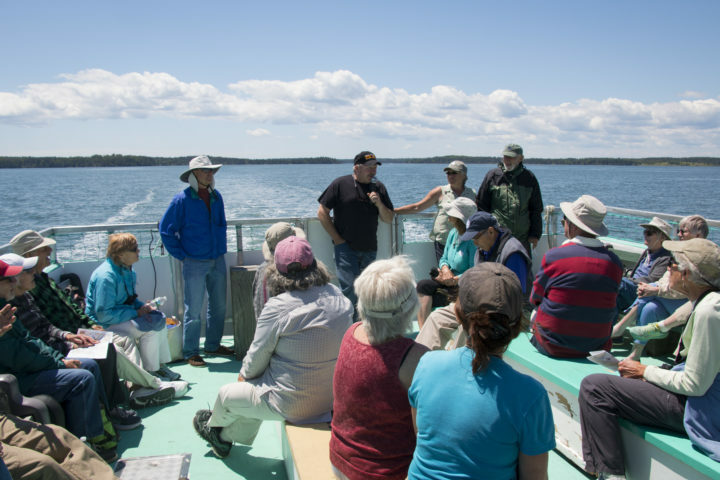 George "Butch" Harris, captain of the Ocean Obsession, talks about fishing for urchins and scallops in Cobscook Bay during a Maine Coast Heritage Trust boat tour of the area on July 13, launched out of Eastport. 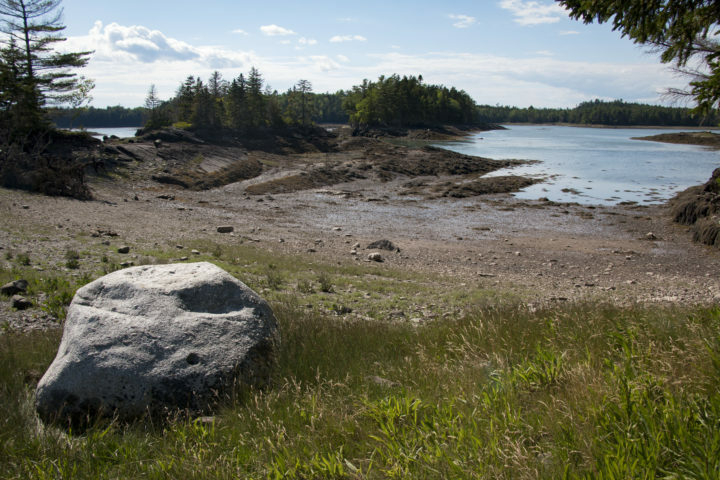 Since it was founded in 1970, MCHT has conserved 150,000 acres and 322 islands along the Maine coast, establishing more than 100 public preserves from Kittery to Lubec. All of these preserves are open to the public to visit for free, offering a wide variety of recreational opportunities including camping, hiking, boating and hunting. From their four offices scattered along the Maine coast, MCHT is continually working with communities to conserve and steward places of historical, cultural, ecological and economic importance. The nonprofit also supports the state’s many local land trusts through its Maine Land Trust Network program and by collaborating with those land trusts to conserve land and complete conservation-related projects. A view from a trail on Sipp Bay Preserve, which is owned and managed by the Maine Coast Heritage Trust and is located in Pembroke. During the boat tour of Cobscook Bay, three MCHT staff members took turns speaking about the history and ecology of the area. The route highlighted several MCHT preserves and conservation easements. The history of Treat Island, acquired by MCHT in 2009, captivated Whitehead when she began researching it a decade ago — so much so that she continues to dig up information about the island to this day, reading local records and old books about the island’s early inhabitants. Dudley Island is a tiny isle connected by a thread of land to a larger island called Treat Island in Cobscook Bay. Treat Island is owned and managed by the Maine Coast Heritage Trust and is open for the public to visit. She’s found the written history of the island dates back to 1784, when a trading post was established on the island by Revolutionary War Col. John Allan. Known for recruiting local Indian tribes to stand with the Patriots against the British, Allen was buried on Treat Island. A a 1.2-mile trail network leads to a monument at his grave. The trail network also features stunning views of the ocean, where visitors often spot whales, porpoises, seals and eagles. Cobscook Bay, Whitehead explained, has the highest density of nesting bald eagles in the northeastern United States, and a high diversity of plant and animal live there because of its extreme tidal range. Each tide brings in a fresh supply of nutrients, which support growth of seaweed and algae, which is then eaten by shellfish and other sea creatures. Continuing past the island, the recent Cobscook Bay tour navigated past Shackford Head, named after one of the town’s earliest settlers, Revolutionary War Capt. John Shackford. Today, it’s conserved as Shackford Head State Park, 90 acres with more than 3 miles of public trails. Turning north, the boat then visited the 14-acre Matthews Island, an MCHT preserve that is accessible from Eastport when a land bridge emerges for 2.5 hours on either side of low tide. The island is named after Capt. Charles Matthews, who purchased the island in 1798 and raised his eight children there. 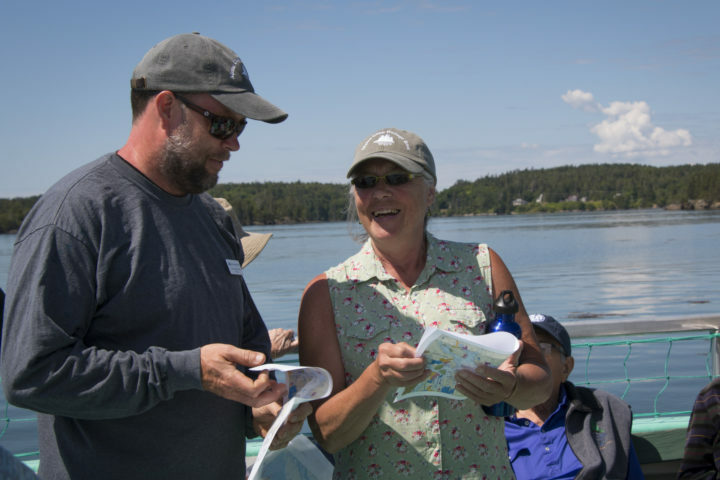 Maine Coast Heritage Trust regional steward Deirdre Whitehead talks with MCHT project manager Jacob van de Sande during a boat tour of Cobscook Bay hosted by MCHT on July 13, launched out of Eastport. From there, the boat struck east, then north, to the edge of Sipp Bay, named for Scipeo Dalton, an African-American man who lived with his wife in a cabin in the area in 1790. 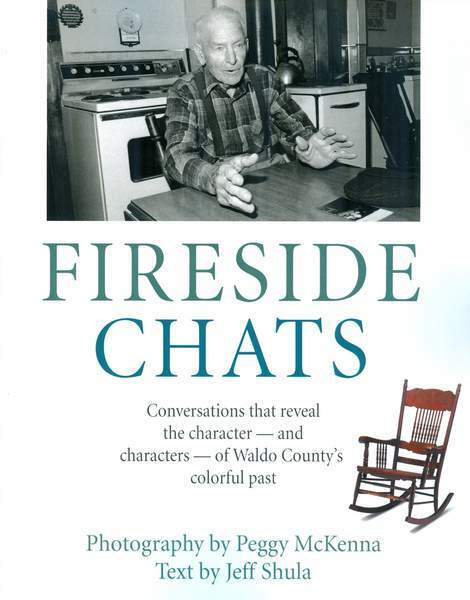 “He was a freed slave, and he and his wife were on the first census of Washington County,” Whitehead said. The Passamaquoddy called the place Kci-puna-muhkatik, “big frostfish (tomcod) spawning place,” and they used to fish the bay by canoe. In 2010 and 2011, MCHT acquired two parcels of land on the shallow bay and established the 92-acre Sipp Bay Preserve, which features 1.5 miles of trails and a beautiful picnic spot. Backtracking out of the tranquil bay, the tour headed south, to Reversing Falls, an area off the coast of Pembroke where water builds up as it rushes over an underwater ledge between Mahar Point and Falls Island, creating what appears to be a waterfall, as well as whirlpools and swells. The tour boat’s captain, George “Butch” Harris, expertly steered through the frothing water and swift currents, then turned the boat back toward Eastport. The tour also was an opportunity for MCHT staff to talk about conservation projects that are underway but in need of more funding. For example, MCHT just purchased its largest property yet — 2,352 acres of land on Rocky Lake in Whiting — and it’s working to raise $300,000 to develop and manage the property for camping, paddling and hiking. 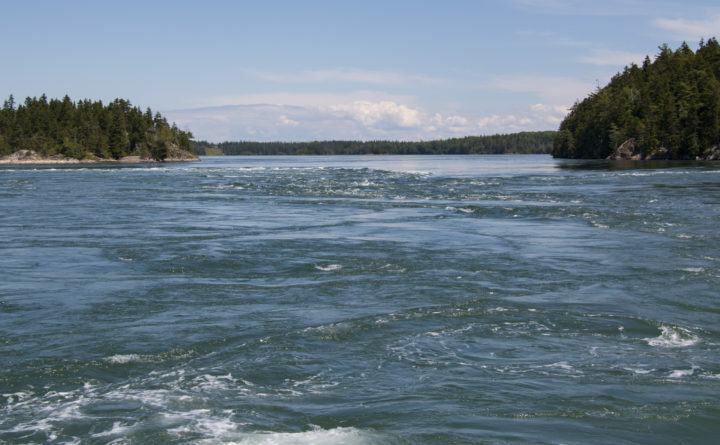 In addition, MCHT is working on improving fish passage and establishing portage sites on the Orange River, which flows out of Rocky Lake and winds its way east to Cobscook Bay. 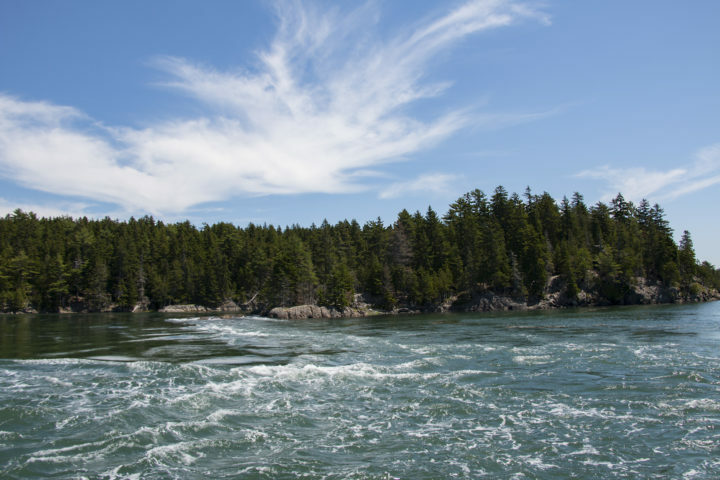 MCHT also is tackling conservation projects all along the Maine coast, including the acquisition of Clark Island in St. George, and Woodward Point in Casco Bay. 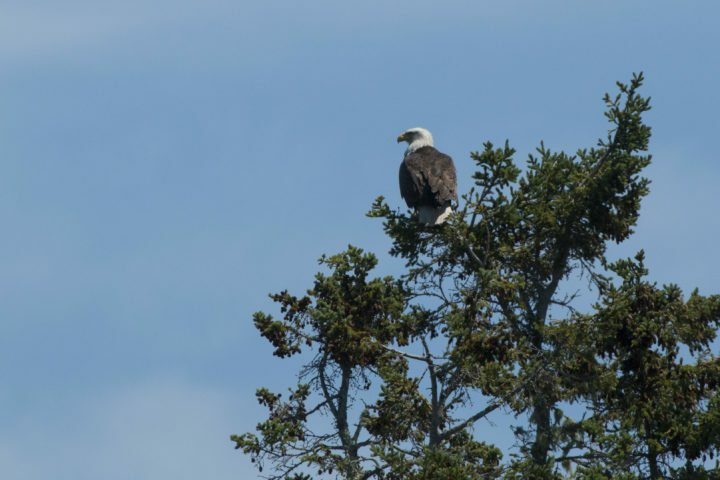 A bald eagle perches atop a tall evergreen on one of the many islands in Cobscook Bay on July 13, and is admired by the 45 people on a boat tour organized by the Maine Coast Heritage Trust of the bay. An open house of Treat Island, with shuttles to and from the island from Eastport and Lubec, is scheduled for 11 a.m. to 4:30 p.m. Sept. 15, and will feature optional history walk by Whitehead. The shuttle, out and back, will cost $10 per person or $25 per family. To learn about MCHT’s upcoming field trips and events, visit https://mcht.org/trips-events. Upcoming trips include a Boot Head Beach cleanup July 26 in Lubec, a Clark Island open house Aug. 19 in St. George, a Casco Bay sunset cocktail cruise Sept. 13 and a Treat Island open house Sept. 15.